Display an under construction page. Display a maintenance mode page. Display a product launch time. Display an event launch time. The widget page can be enabled or disabled whenever you need for any of these purposes. 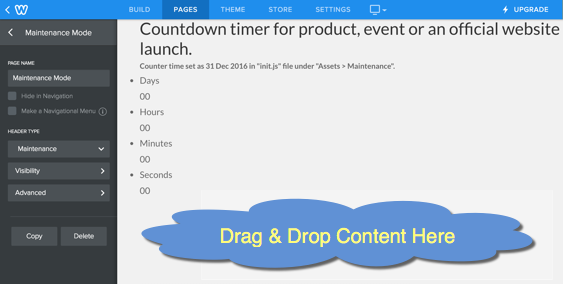 Check out our separate article in case if you are looking for a countdown timer widget. Checkout the under construction page demo in a Weebly site. Below are the files required for creating a custom maintenance mode page layout in Weebly. Click on the download button to get the zip file. We use a demo image “bg.jpg” for the background which you can change it with your own image (ensure to use the same “bg.jpg” as file name). Create a folder named “Maintenance” under “Theme > Edit HTML / CSS > Assets”. Unzip the downloaded file and upload all the individual files under the “Maintenance” folder except “Maintenance.html” file. Upload the “Maintenance.html” file under “Header Type”, this will be the page layout name showing under “Pages” tab. Now everything is set…save your changes and go to Weebly site editor. Create a new page, name it as “Maintenance” and choose the header type layout as “Maintenance” from the dropdown. You can see the some text data as shown in the picture below under which you can drag & drop you own content. Publish your site and see the maintenance mode layout in action. The above way of setting up maintenance mode is easy for a new site. If you have an existing Weebly site, at least you should have two sites with premium features to enable this setup. Setup the maintenance mode layout on a new site. Publish the new site with the original URL. If you only have few pages on the existing site, it is a good idea to make the “Maintenance” page as your home page and setup 301 redirects for all other pages to point to the maintenance page. Since search engines like Google are very fast in crawling the existing sites, we do not recommend using maintenance mode for existing Weebly site in order not to disturb your search engine ranking.